While the many tendrils of the octopus that is GoreAndLombard.com dip into many pies, perhaps no pie is sweeter than that of the ANNIE NOMINATED "Disney's Dave The Barbarian." The drawings are funny, the songs are funny, the characters are funny, the lines are funny, the stories are funny, the voices are funny. Why bother going to a second season, if you've perfected everything the first season? If you, dear viewer, are at all smart, cool or think you "know funny," then stop what you're doing and make an appointment with the Disney Channel. Watch this undiscovered gem in the treasure chest that is your cable box. 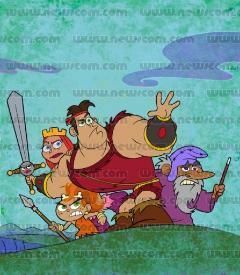 For more, see the Disney Channel's Dave The Barbarian website. This image, like all those appearing on GoreAndLombard.com is used illegally and without permission. We just went to Google Images and downloaded it. It was so easy. You should try it. Hold your mouse over the image you want to copy to your hard drive, hold down the RIGHT mouse button, and select "copy picture." Thanks Microsoft, you do everything right the first time.